Under shrewd handling by SLADE CALLAGHAN, the champ, RAHY’S ATTORNEY held on bravely to win the $300,000 KING EDWARD STAKES yesterday at Woodbine in course record time – a very fast 1:44.73, smashing the previous record of 1:45.20. The Crown Attorney 5yo gelding could be better than ever this year and he earned a 106 Beyer Figure for the one-length score over rival STERWINS. It was Sterwins who nailed him at the wire in the Connaught Cup a few weeks back but that one was handcuffed by a soft pace over the hard turf yesterday. Sterwins broke sluggishly, rushed up to duel for the lead down the backstretch, rated off the pace and then tried to gain on Rahy but he couldn’t do it. Rahy’s Attorney swapped to his wrong lead early in the stretch and looked like he was lugging in but he held strong. It was his 8th win in his 29th straight for the Ellie Boje, Peters, Read group and trainer Ian Black. Speed was the name of the game on turf and Polytrack yesterday – the front runners hogged all the races on a warm day. WAVE BABY – RHYHTM OF THE SEA led from start to finish in 51 4/5 over a fast Polytrack to win race 1 for 2yo fillies for $62,500 claiming at 4 1/2 furlongs. A race later, Ontario bred OISTENS had to work hard at 3 to 5 to win over a first-time starter – TALK ABOUT IT – but gave the Terry Jordan barn yet another win nevertheless, surging just enough ahead to secure the win. The Peaks and valleys filly, out of Twelve Mills, by Boone’s Mill, was bred by Gord Colbourne. She had trouble in her debut and was almost everyone’s pick to win 2nd time out under Jim McAleney. Her time for 4 1/2 furlongs was 52 1/5. Talk About It, a Where’s The Ring gal, looked super in defeat for the Catherine Day Phillips barn – especially for a $5,622 purchase as a yearling. LADY ATTACK pounced on her rivals in a turf allowance in race 3 and looks like a nice prospect for Josie Carroll and the Hill ‘n’ Dale Equine Holdings team. The Mutakkdim mare, graded stakes placed, seems to love the long stretch of the Woodbine course. She won by more than 5 lengths with an 89 Beyer Figure for the 1 1/16 miles on turf. 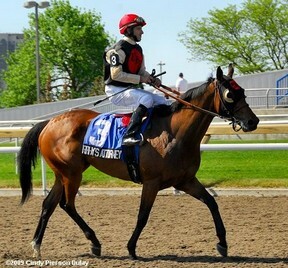 Barney Tzalazidis’ homebred 3yo PETER’S CHARISMA won a maiden allowance in his 5th career start at 1 1/8 miles in race 4. The Cat’s At Home fellow is out of Hush Money and he was ridden by Emile Ramsammy for John LeBlanc Jr.
Avid horsewoman and THOROUGHBLOG friend LOIS KEAYS celebrated when the 3yo she bred, STAN ON GUARD was a romping winner of race 5 for Promising Racing Stable and trainer Danny Yu. The Patrol – Tumbling Act, Kiridashi gelding ran 4th in his debut and simply romped yesterday for $16,000 claiming under Anthony Stephen. And how about that claim of ALAMANDA DRIVE by Sam Passero/Robert Gilyana on June 5. 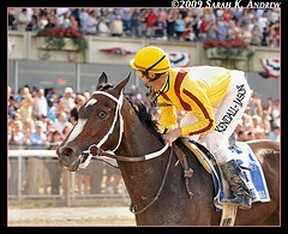 They took her from a maiden win for $20K and won a $40K turf race with her yesterday. The Awesome Again filly led all the way under a beautiful ride by Rui Pimentel, who hardly used the whip at all on the bay gal. Incredible – that’s about all that can be said about this filly, she’s one of the fastest horses we’ve seen in some time. And who knows what would have happened if she was ridden out in the MOTHER GOOSE YESTERDAY, instead of her rider Calvin Borel, easing her up to start doing his little celebrations? She would have raced the 1 1/8 miles, not in 1:46, maybe 1:45?? Wow. Of course, it helps when the only 2 other rivals in the race set silly pace fractions up front but Rachel was not far off that pace anyway and once that pair wilted, she zoomed by, strolled clear and won by 19 1/4 lengths, again, with Borel doing a dance. Would love to see what this filly really has. And what a shame this Medaglia D’Oro gal will not head west to the Breeders’ Cup. 111 Beyer Figure for Rachel…. – Okay, we can’t forget about the older gal, the monster from the west, ZENTAYYA, who stayed unbeaten to win the Milday at Hollywood yesterday. 104 Beyer Figure – she has never really had to run fast to win her races but she looks good doing it. And hey, she carried 129 pounds and that’s pretty cool – even if you don’t believe in the weight factor. Whatever happened to If the shoe fits on the Sunday score show? It’s been missing from the last two broadcasts and no one has said a thing about it? Who cares? having cletus from the simpsons act like a fool on camera has no place on a professional broadcast. The broadcast is silly and campy enough without him. Mike Dunslow no longer works for Woodbine so the ‘If the Shoe Fits’ segment is no longer…. Thought so but just checking. ps.. congrats to the connections of RAHY’S ATTORNEY..